Someone at the Washington Post caught an error on the NFL’s website. The NFL’s online store is offering team plates with each plate showing the team’s logo over the state’s outline and someone made the mistake by using the outline of Washington State instead of Washington, D.C. for the Redskins. Whoops! The plate has been removed since the Washington Post posted the story and since these are only mockups there is nothing physical to show someone’s geographical error. But as everyone knows, once an image is on the internet it will always remain on the internet. 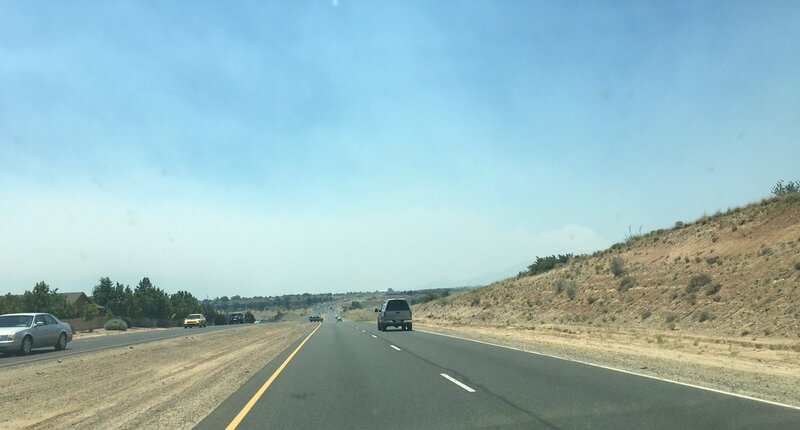 Update on the Goodwin fire: It is up to 25,000 acres but is now 25% contained and my area is still being used as the evacuation center so we are safe and not under a pre-evacuation order. 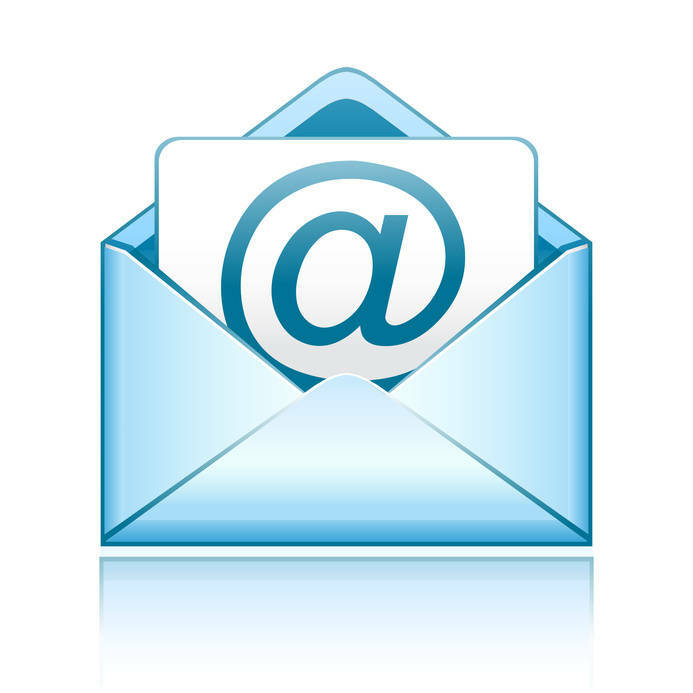 Today is a personal post, something I rarely do outside of extreme circumstances. I live in an area near Prescott in Northern Arizona. 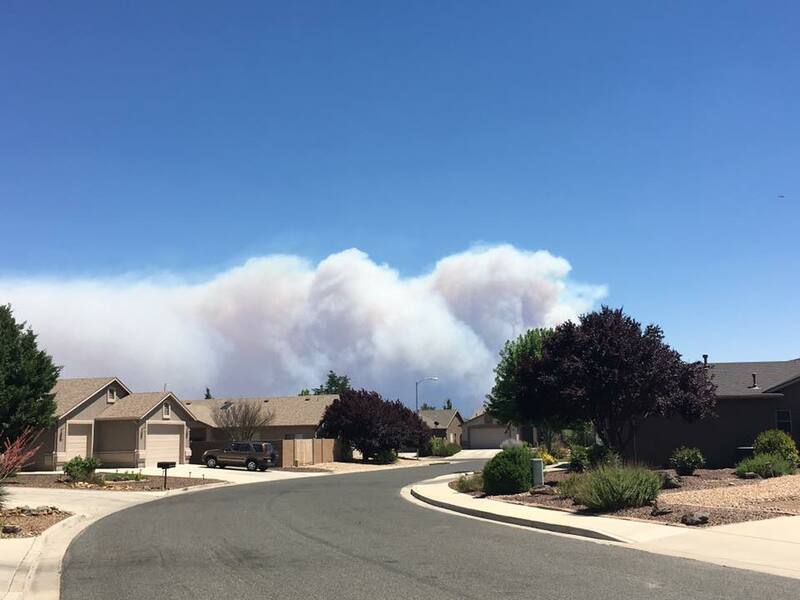 Currently there is a large brush fire, the Goodwin fire, that is burning to the south and east of my town. 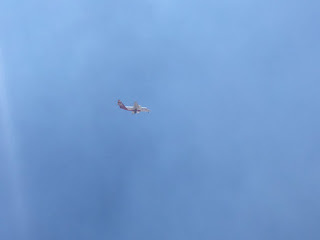 It started last Saturday and is now up to 20,644 acres burned with 1% controlled. This was the view from my street yesterday when the fire was 4,400 acres and 12 miles away. This is what it looks like now in my area. The smoke is so heavy and down to the ground it looks like fog or a dust storm and there is ash falling from the sky. Visibility is about 2 miles and there should be Bradshaw Mountain in the background but it is engulfed entirely with smoke. My son’s school is being used as the evacuation site for areas that have already been evacuated. 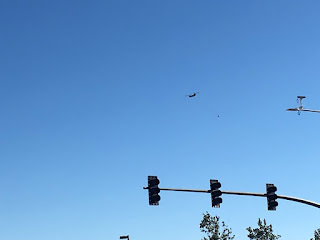 There are observation planes and helicopters flying over the house so low it rattles the walls and there are large flying tankers and Chinook helicopters towing water tanks going by regularly. Luckily there have not been any loss of life. This is a spotter plane flying over my house, he was about 500 feet up and you can see the smoke even makes this picture blurry. 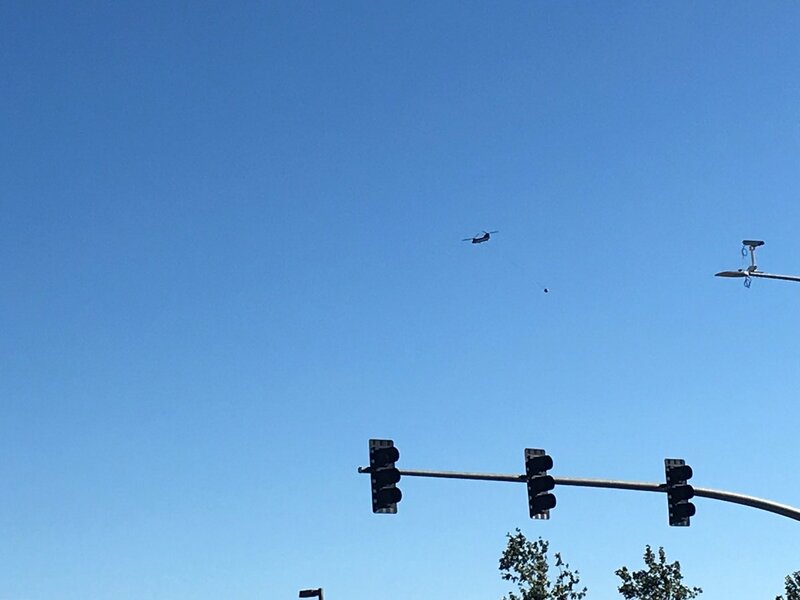 This is a Chinook yesterday flying from a nearby lake towing a water tank towards Bradshaw Mountain. At this point my town has not been issued the pre-evacuation warning but I have begun getting things ready in case we do have to leave. I hit Walmart this morning to stock up on supplies and they are stacked in my garage ready to toss in to my Tahoe at a moment’s notice. Now that I am comfortable that I have the important things ready to go I have begun to pull parts of my collection aside. This is most of what I would be taking; my entire Griffey collection along with my Buhner, Largent and Bader collections. My binders, which include relics, autographs, limited cards and sketch cards. 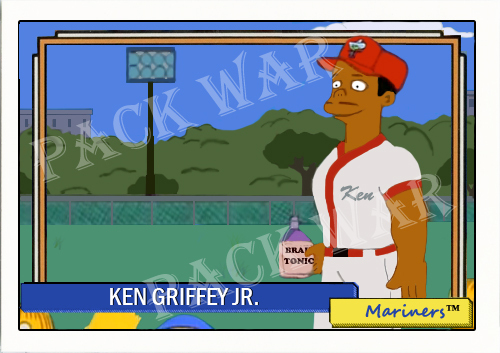 My Griffey memorabilia and all of my displayed cards can be tossed in to the document boxes if it gets to the point I need to leave. 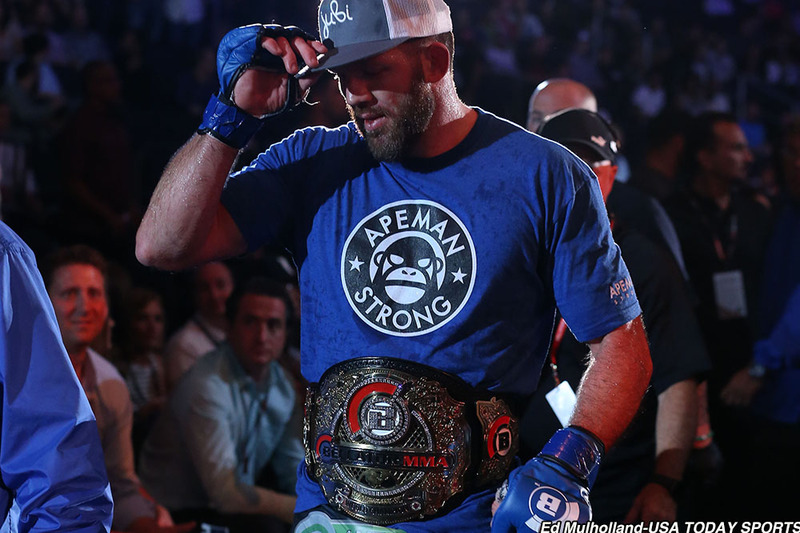 Last Saturday night Ryan Bader had his first fight in Bellator MMA against Light-Heavyweight Champion Phil Davis for the belt, something that Bader never had the opportunity to do in the UFC. 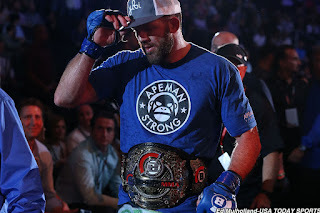 The fight went the full 5 rounds and went to the judges and in a split decision Ryan Bader became the new Bellator Light-Heavyweight Champion. It was a nail bitter until the end, it could have gone either way and I really thought Davis did enough to appear more active, though all of his takedown attempts were stuffed by Bader, and win over the judges but when the announcer said "And new champion..." I jumped out of my seat. I have not picked up many Bader cards lately but I did grab this 2017 Topps Knockout Auto-Relic about a week ago. 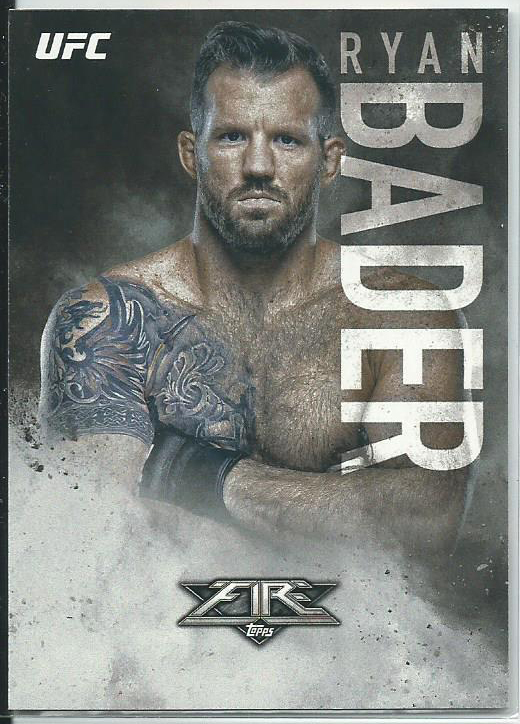 This is my 129th Ryan Bader card (Not counting three Topps Vault cards) which puts my collection at 38.8% of all Bader cards. Monday Question Day- Throwback Unis? Would you be interested in a set built completely on alternative or throwback uniforms? Baseball obviously would be the best option because they do throwback games often each season so there would be many opportunities for photographing the players. Football and basketball do a number of throwback or alternative uniform games (NFL color rush and NBA Cinco de Mayo come to mind) but not as often as baseball. Currently there are the occasional throwback or alternative jersey that shows up on cards, usually as a SP, but I would love to see a base set built only on throwbacks and/or alternative uniforms. 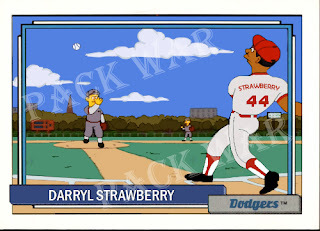 Maybe toss in a couple of autographs (sticker autos would probably be necessary) and have an insert based on decades for example uniforms of the Dodgers in the 1940s, 1950s, 1960s, etc. and that would be it. 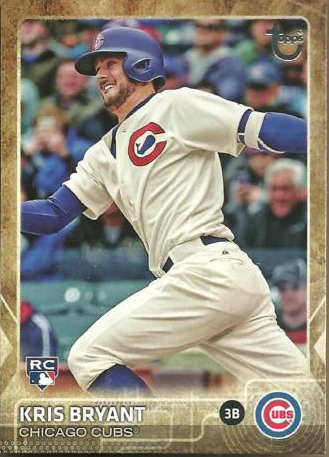 This 2015 Topps Update Bryant Throwback variant, I do not own this card, is a perfect example of what I am talking about. I would love a set built around throwbacks and alternative uniforms like this. I have completed the Mr. Burns card and will eventually get to the backs, I am just going to make up stats for Homer and just create a bio for Mr. Burns. I am not going to work on the backs just yet but instead I have turned my attention to a couple of custom cards that have been rattling around my brain for awhile. This month I decided to skin some chrome cards to see what is hidden beneath that shiny surface. I did skin a Bowman Chrome and a Topps Chrome about a month ago in response to a thread on Blowout Forums where someone posted images of a prototype card that they had that was based on the 2014 Bowman Chrome Daniel McGrath card only acetate and instead of listing his specific position (Pitcher) it just said “Position”. 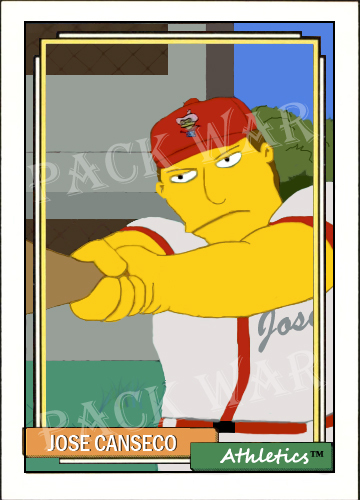 A couple of people were claiming it was a manipulated Bowman Chrome card so I decided to try to see if I came up with the same thing as far as being clear. As you can see with this experiment that is not the case, the card backs are mirrored and not clear so obviously the card the OP posted about was not a manipulated Bowman Chrome card. The OP did contact Topps, got an “I don’t know answer” and they did submit it to BGS for grading. As of May16th there has not been an update as to the cards origins. I am guessing it was an early prototype. I did the same procedure as before with placing two cards face back down in to water. The donor cards this time are a 2013 Bowman Chrome Brandon Maurer and a 2013 Panini Prizm Percy Harvin. I left the cards in the water for 16 hours, dried them off and removed the backs as best I could. Since the paper attached to the adhesive is a bit difficult I placed the cards back in to the water, again backs down. After 4 hours I removed the cards, dried them off and then removed the paper I could get off. I did place the cards back in to the water overnight to separate the remaining paper, removed them from the water, dried them off and completed the experiment. After soaking in the water for 16 hours first, then 4 hours and finally 12 hours I could completely remove all of the paper from the Bowman Chrome but the adhesive on the Panini Prizm card did not dissolve enough and I could not remove any additional paper from the back. Either Panini uses a different adhesive or the way they apply it makes it stick better to the card. I did accidently bend the Bowman Chrome while drying it off, that is why it appears to have a black smudge across the top half of the card in the final photo. That is my monitor reflecting off of the card when I took the picture, that black mark is not on the card. Just a quick update, I re-arrange the kids on the Griffey card and I feel better about the proportions of the card now. Next it is back to the Mr. Burns card and then finally working on the back of the Homer and Mr. Burns cards before putting the set together. 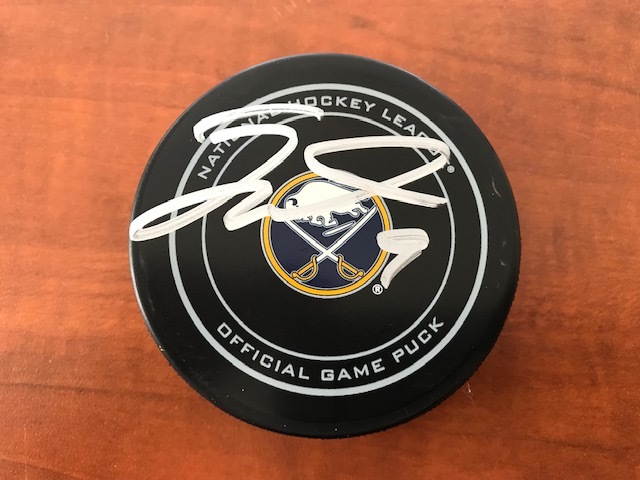 Monday Question Day (On Tuesday Again)- Prospect Much? Are you a prospector in the sports you collect? 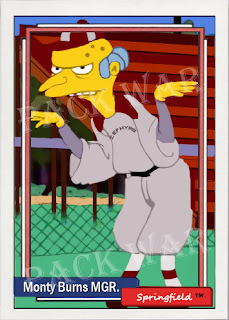 I have a horrible track record prospecting so I do not chase those cards. Baseball is probably the biggest prospecting sport because it can be months or years before the player makes it to the big leagues so you have to be ready to make decisions and sit on those cards. 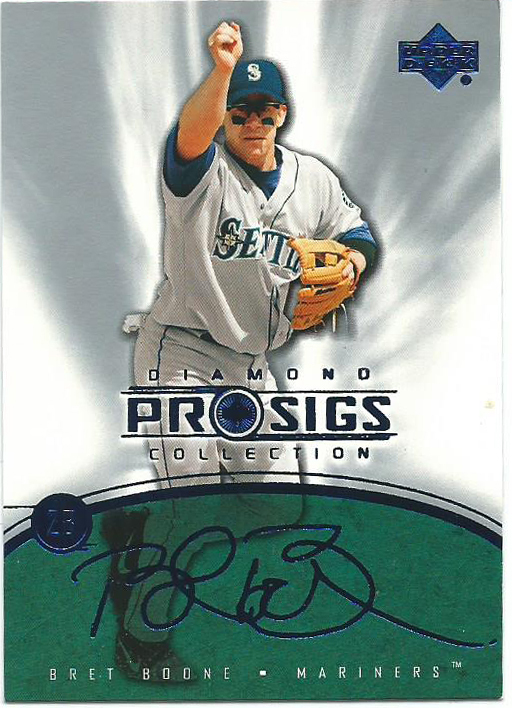 My first attempt at prospecting was in 1993 when everyone in the LCS was picking up cards of a kid named Derek Jeter I was instead interested in Tim Salmon cards because he went to college locally at Grand Canyon University. Salmon did go on to be AL ROY in 1993 and he was part of the 2002 Angels team that won the World Series but apparently, that Jeter kid went on to something special… yes, my choice of Salmon over Jeter still burns me 24 years later. 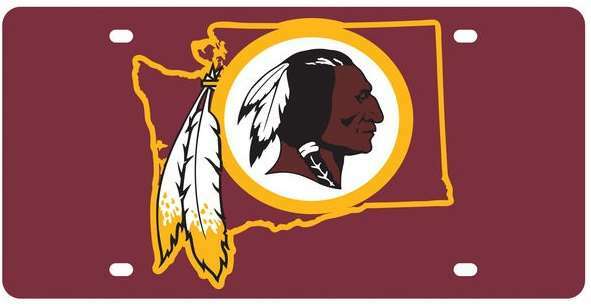 Now I just pick up what I like but only for Seattle teams and don’t worry about future value. This sketch card showed up in my suggestions feed recently and I feel bad for whoever pulled the card. Something ran down the card, it appears like a uniform scuff so I am going to guess that it was some sort of machinery that slid down the card during or after pack out. The card began with a .99 cent starting bid and currently has one bid at that price. 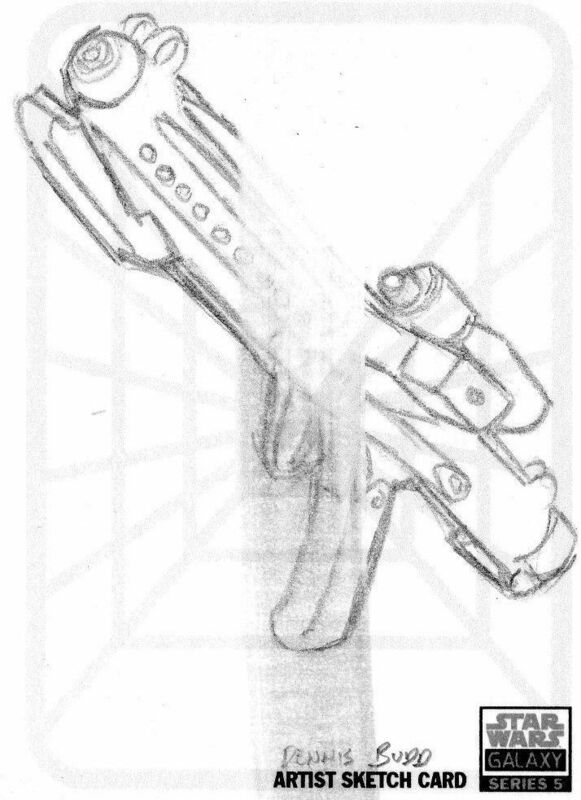 I mean the gun looks pretty good but it is a simple pencil sketch and it is altered/damaged so I am surprised that there is a bid on it. This is the kind of sketch card I would toss in to a bundle/lot of cards that I would sell but it is going to sell so I guess someone wants it. 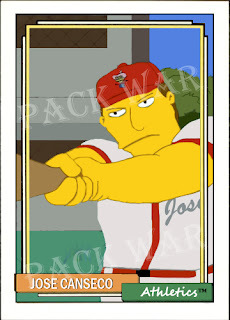 On May 27th, Homer Jay Simpson was inducted in to the Baseball Hall of Fame in Cooperstown, NY on the 25th Anniversary of one of the best Simpsons episodes ever Homer At The Bat. His Hall of Fame honor also includes his stint as the mascot of the Springfield Isotopes and the Capital City baseball team. 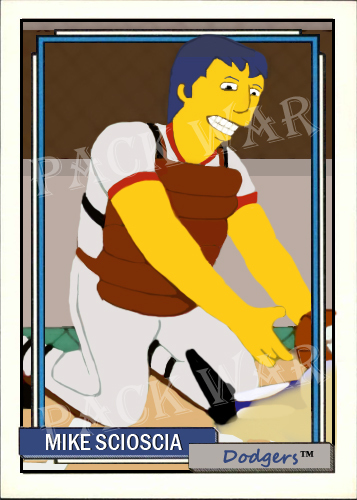 Seeing Homer inducted in to the Hall of Fame got me to finally complete a project that I began nearly 3 years ago, a Simpsons set from the Homer at the Bat episode designed using the 1992 Topps design. 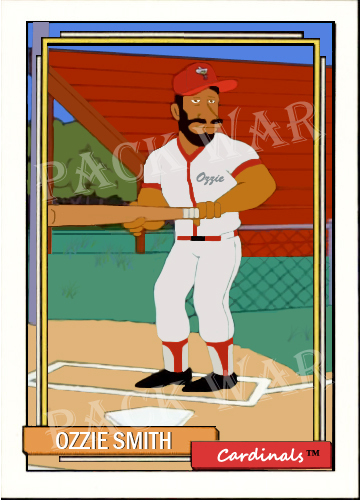 I have seen people put some cards together but there has never been a complete set using the same design and in my typical form I had to have the set how I wanted it to be, a set based on the players in action. The reason it took me so long is that, well besides the procrastinating, I illustrated each one by hand before inking and coloring it in Photoshop. I kind of went all out on this set and I am happy with how it is coming along. Everything is the same throughout the set, every uniform, grass, tree, dirt, sky and clouds are the exact same color as all of the other cards. 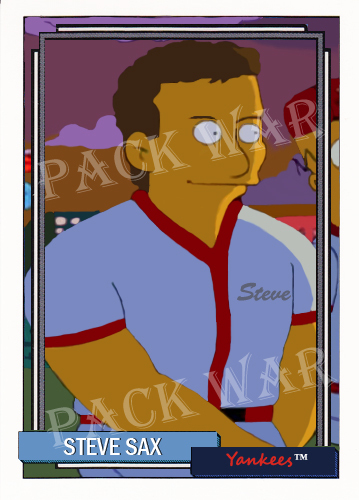 The only difference is Steve Sax’s card because I used an evening image and Mr. Burns uniform is different because he wears a Zephyrs’ uniform not a Springfield Nuclear Plant uniform. It may not be perfect if you were to compare the image versus the scene in the episode but it is my set and I am proud of it. 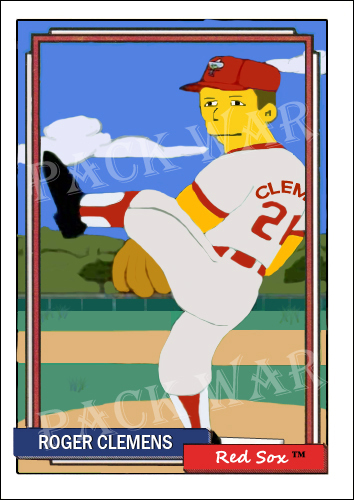 I am not done yet I plan on making these digital files in to tangible cards using the player’s real 1992 Topps baseball card but I will need to make Homer and Burns’ card backs. Looking at the cards I see I still need to do a couple of touchups. I need to capitalize Mr. Burns' name and I want to remove the chain link fence from behind him completely and I want to raise up the children on the Griffey card so the left hand side of the card isn't so empty. 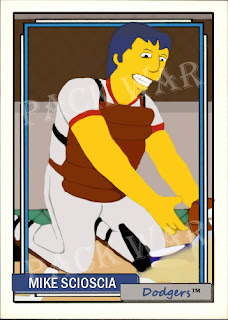 Mattingly! I thought I told you to trim those sideburns! GO HOME!!! YOU'RE OFF THE TEAM, FOR GOOD!!! My son has taken an interest in hitting up swap meets, flea markets and thrift shops because his friends have come up with some insane deals on clothing and it drew him in and occasionally on the weekends I will go with him. 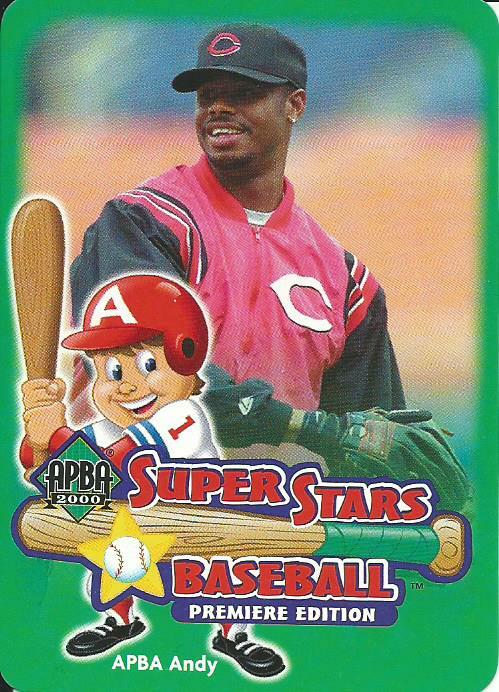 This past weekend I had to do some errands and we stopped by a local thrift shop and I came across a kid’s board game from 2000 that included a Ken Griffey Jr game piece. The box was sealed so I took a chance that the Griffey piece wasn’t in there but at $2 it wasn’t really a big risk of losing out if anything was missing. 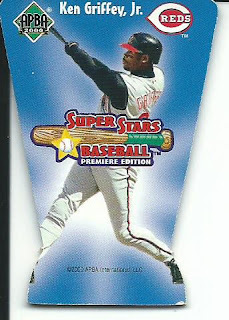 When I got home and ripped the plastic wrap off it turned out that everything was included plus one of the player cards is a Griffey card in addition to the game piece. The game is called APBA Superstars Baseball and there is a kids version of football as well as ones for adults where the cards are just information so no pictures. Labels: Ken Griffey Jr, Ken Griffey Jr. 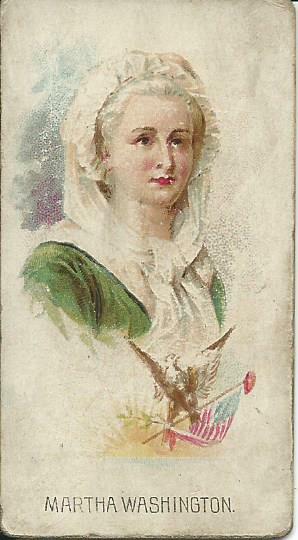 This month’s VCoM is of the first First Lady Martha Washington and comes from 1889 and is part of the 1889 N222 Kinney Brothers Leaders set, which was included in packs of Kinney Brothers cigarette packs like their brand Sweet Caporal. These cards are just amazingly beautiful, just something you wouldn’t see in anything released in the modern era. I think tobacco and candy cards are generally the most amazing cards illustration-wise. When you consider that this card is 128 years old it has held up amazingly well. The colors are fading but still vibrant, the filigree on the back is still completely visible but there is some paper wear and staining. I got a kick out of the “These cards can be retained” on the bottom of the card, something that does not need to be included these days. 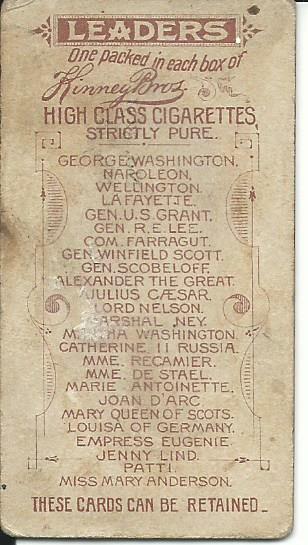 The cards are also thick, especially for a tobacco era card, about 35-pt and this one is still solid. 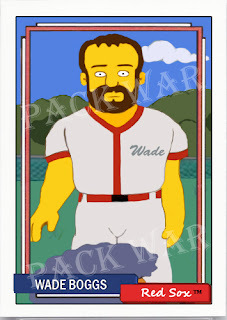 This card will be difficult to top. Monday Question Day (On Tuesday)- Checklist Cards? 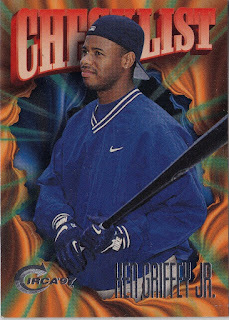 If a player you collect is on a checklist do you include this in your PC collection? 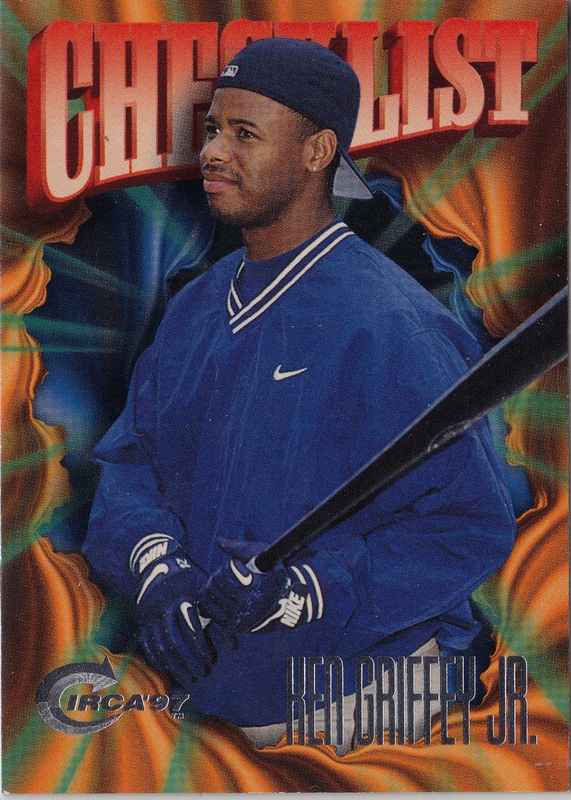 Going through my collection I noticed that Ken Griffey Jr is include on quite a few checklists, both team and set, so if his image appears on the card I do include them in my Griffey PC. I want to thank Raz for his very welcomed care package last week that included a group of 2017 Ryan Bader cards that I did not have in my collection. 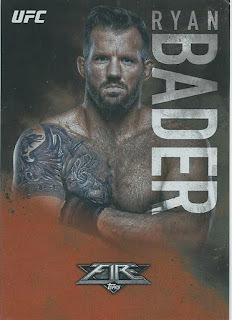 Like my other PCs my Bader collection is on hold for now and with two Topps UFC releases this year I was falling behind on my collection. 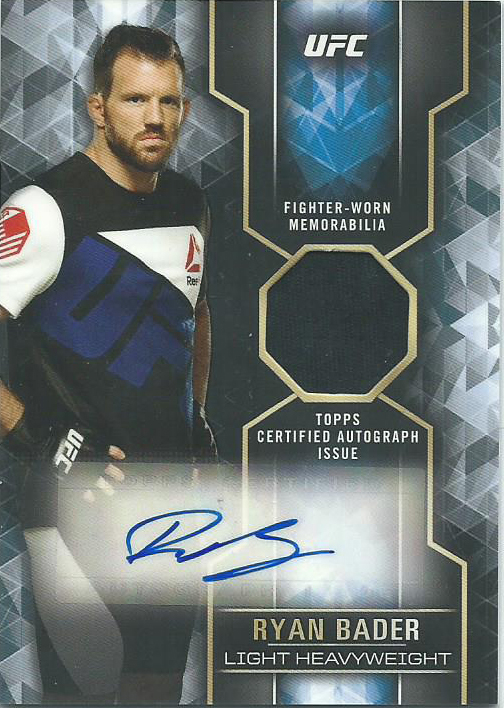 The first two cards are from the 2017 Topps UFC Fire release, which was only available online. The set was not very large; only 50 base cards, 39 autographs and 20 Fired Up inserts. Each base card had 3 parallels in addition to the base cards and the autographs had 2 parallels in addition to the base auto. 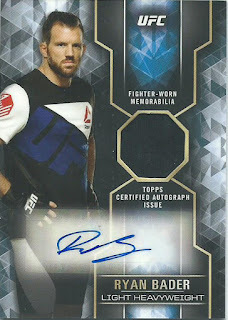 The next two cards are from the 2017 Topps UFC Knockout release, which came out less than a month ago. Bader was removed from the checklist to this set because he signed with Bellator MMA in March but because most of the autographs are hard signed they had already been sent out and he signed and returned them so Topps decided to include his autograph and relic cards after all. 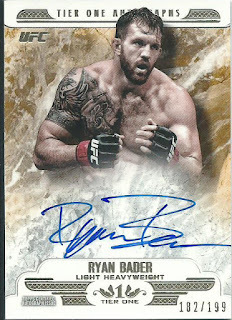 The first card is his Tier One autograph, these cards are amazing and right now this is one of my favorite Bader autographs that is in my collection. I just love the design of these cards and the parallels are even cooler with the card being black and signed in either copper, silver or gold ink. The second card is his Knockout Autographs. 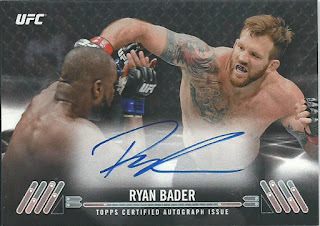 Topps tends to use the horizontal design with Knockout, which I like because it allows them to use images that are extended like this overhead strike from Bader’s fight against Rashad Evans. This is what his base card would have looked like if it were included in the set minus the autograph. Again, thank you so much Raz, I really appreciate you taking the time to send me this package. Last month John from Johnny’s Trading Spot held a Big Fun Game contest and I was slotted #17 out of 21 picks. 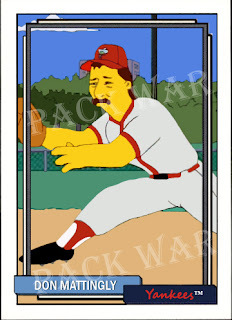 I ended up stealing a Highland Mint Rick Mirer Mint Card from Oscar of All Trade Bait, All The Time. Up until I had seen the Mirer card selected at the #10 spot I was planning on just picking a number but when it comes to one of my favorite Seahawks QBs I had no choice. 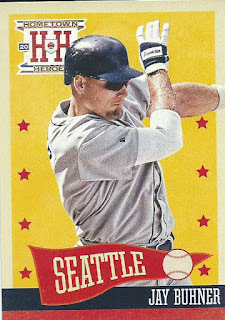 The card is based on Mirer’s 1993 Topps RC #285, but more majestic, and The Highland Mint went all out on the package. The card is enclosed in a plastic clam shell and when opened the COA is folded in a sleeve on one side and the card is nestled in to a one-inch screw down on top of a piece of felt. John included a collection of Mariners from current back to a 1983 Donruss Bryan Clark and a trading card sized Mariners felt pennant that is now hanging out with my Mariners Moose Funko Pop. The Mariners are sitting at 30-30 after a 5-game win streak. 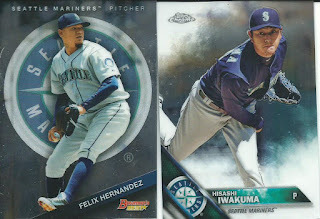 Currently Hernandez and Iwakuma are on the DL but that doesn’t stop shiny cards from shining. Iwakuma will be going through a simulated game on Sunday and well, Hernandez needs to stop hurting himself while celebrating. 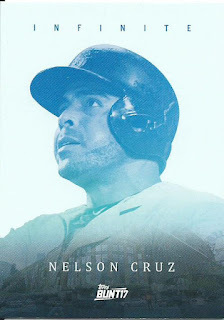 I am a fan of the physical Bunt cards and inserts like this Cruz Infinite card are the reason why. Cruz is teetering on the DL with tightness to his calf and is missing his second game in a row. 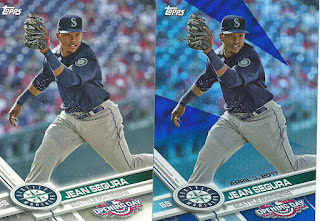 A pair of 2017 Topps Opening Day Jean Segura (Base and Rainbow Foil). Segura has found the perfect spot in Seattle and just signing a contract extension last week. He had a good year with the Diamondbacks last year but he really looks like he may top it this year. 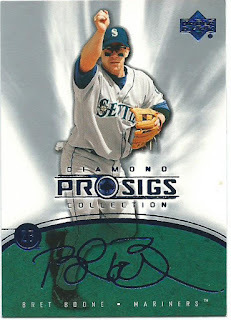 Brett Boone was loved in Seattle and his second tenure he was uncontested leader of the team, including the 2001 116-win team. This is a printed autograph so I still go without a Boonie auto in my Mariners’ collection but I hope to add one before the end of the year. 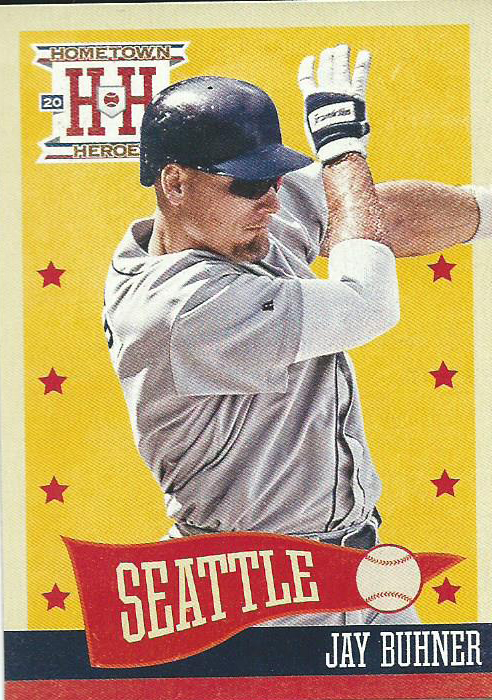 I end with a 2013 Panini Hometown Heroes Jay Buhner, a card straight from my Bone Want List. 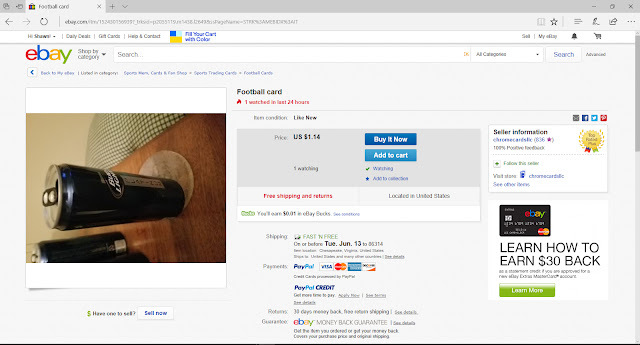 Last night while going through eBay this auction showed up as a suggestion while I was looking through football cards. This is one of those times where you start setting up an auction but get about 30 seconds in and realize you just don’t care. I did check the seller and I am pretty sure this was either a joke or done by accident, he has an eBay store with nearly 1,500 items currently up for auction and for the most part they are all posted in a way that includes a descriptive title and an image of the card. Makes you wonder that if someone wins what card would he send out? *Note: This post was written in 2015 and I finally am getting around to posting it. 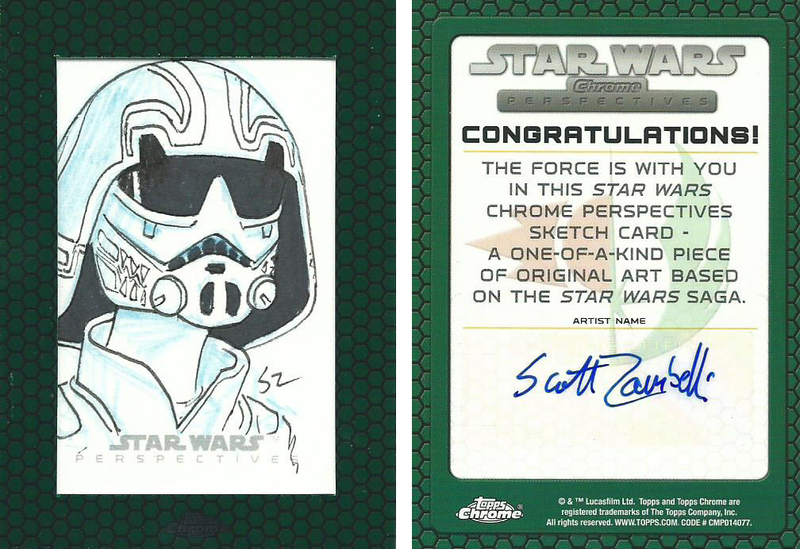 This month’s Art Gallery display comes from Scott Zambelli, a freelance illustrator who has been working with Lucasfilm on a couple of Star Wars projects as well as Topps and Breygent for various sketch card sets. This card is from one of the more recent Topps Star Wars releases, 2015 Topps Star Wars Chrome Perspectives. Since the announcement for Star Wars Episode VII: The Force Awakens in 2015 companies connected to the franchise went in to overdrive. Disney released two animated television shows, Hasbro released new toys and Topps continued their set releases plus add a digital app and Funko made a new line of vinyl figures. I enjoy both Disney shows, Rebels and Droid Tales (which morphed in to Star Wars The Freemaker Adventures), but I really dig Rebels. The show is set between Revenge of the Sith and A New Hope. Anakin has become Darth Vader and people are beginning to rebel trying to throw off the shackles of the Emperor. A small group of rebels led by Jedi Knight Kanan pick up an orphan boy, Ezra, who turns out to be force sensitive and Kanan begins Ezra’s training. Topps released 2015 Topps Star Wars Rebels that year and with the show being a hit the product sold like crazy. 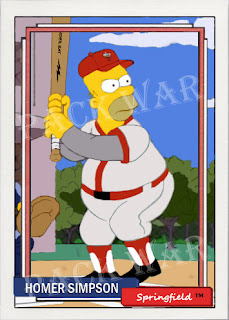 Even now even base cards are selling for close to $2 each and a complete 100- card base set, not counting stickers or tattoos, will run you $30 still and a box will set you back $100 and there are no guaranteed hits (sketch cards). As expected the sketch cards, which it is rumored that there were 500 sketch cards made for the product, are the target of all collectors. 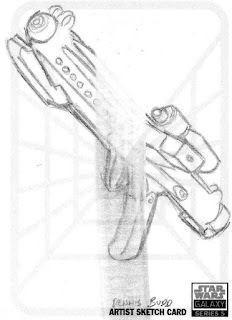 When you can find them they are running well over $100, even for a very basic sketch card, so when I came across this card from the Chrome Perspectives release I jumped on it. 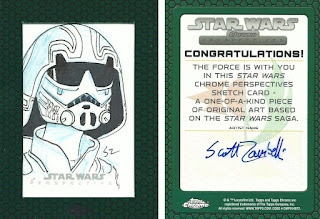 The seller had mistakenly listed the card as “Storm Trooper”, the card is actually Ezra in his Imperial Academy helmet. I know I probably will not be buying any sketch cards from the Topps Rebels release but I had a chance picking up a cool sketch card of one of the main characters from the show for just a couple of bucks and I couldn’t resist. One of my non-sports PC collections is World War I and my cards have made many appearances on my blog, mainly my Manfred von Richthofen vintage collection. Over the years I have added some very cool cards to my collection like an engineer’s uniform relic, a machine gun unit’s blanket relic, two different signal flag relics, sketch cards and a Ghosts of WWI 3D card by Upper Deck. My latest two pickups are welcome additions to my collection and are both from 2014 releases. 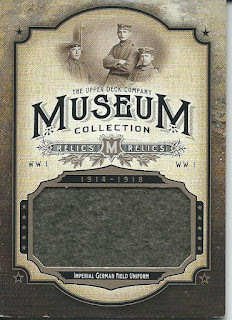 The first is the 2014 Upper Deck Goodwin Champions Museum Collection German field uniform relic. These cards are amazing, they are thick and very heavy duty and the relic is quite large in comparison to regular relic hits. I got this card at a discount because the edges on both the front and back are chipped badly but I don’t care, I don’t buy cards to be graded. The second card is from Cult Stuff, a British card company, and is from the Cult Stuff 1914 release. The set was released in 2014 as part of a respectful celebration of the centennial of the beginning of the Great War. The set was made up of a base set, some inserts, relic cards and sketch cards. 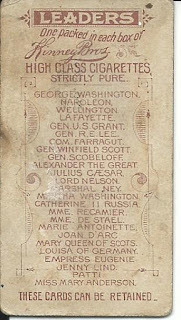 This is a clipping relic card from The War Illustrated magazine, which was printed between 1914 and 1919, to keep people in England up to date on what was happening on the battlefields in Europe. 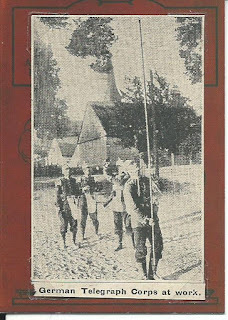 This clipping is a picture of German soldiers setting up telegraph lines and it is damaged along the bottom left corner but when you consider this clipping is close to 100 years old I will let it slide. The clipping is not inside the card or attached to the card, it is being held in place using postage stamp mounts on the four corners. I would have preferred a die-cut window placed in the card and the clipping beneath the window or at least some sort of acetate or plastic over it. I have the card in a penny sleeve in a binder so I feel it is safe where it is for now. Monday Question Day- Where Did It Begin?